The notion of compatibility is an interesting one, which some block-era cards have been playing with recently. Let's see what's out there, shall we? Certain types of cards, which we'll think of as "nouns" -- personnel, ships, and facilities -- can have affiliations, and the notion of compatibility indicates when two of these cards can work together. In most decks, compatibility is not a big issue. In general, any cards that have the same affiliation are compatible (in fact, having the same affiliation makes them matching), and any cards which are from the or affiliation are automatically compatible with everyone. Of course, there's an exception to this -- without exceptions, would it really be 1E? Some personnel cards have a restriction box, indicating that they "do not work with" some other group of people (often an entire affiliation). Lore, for example, will not work with any cards -- he can't report to a outpost, or be on a ship, let alone be in a crew or Away Team containing any personnel. Some cards will also extend compatibility among your nouns. The important text to look for is "mix and cooperate". This means that your cards become compatible with each other, and can work together -- that is, the personnel can be in the same crew or Away Team, and they can be on that ship or outpost or headquarters, and the ship can dock with the outpost. The oldest group of cards which make certain nouns compatible are treaties, which generally make your cards of two different affiliations compatible. 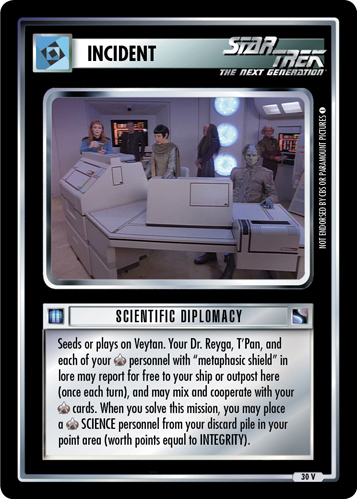 Without a treaty (or some other card that grants compatibility), your two affiliations cannot cooperate: your Klingons can't board your Romulan ship, and your Bajorans can't report to Central Command. With a treaty, things like either of these can happen. Now, issues of compatibility frequently get confused with the related notion of "house arrest". This term, which has an unfortunate prominence in the Glossary, is nothing more than what happens when your cards used to be compatible, and so were together in a crew aboard a ship or facility, and suddenly are no longer compatible. (Typically, the only way for this to happen is for your Treaty to get nullified, by Quinn or The Devil.) Normally, your incompatible cards simply can't get together -- specifically, you can't take any action that puts them together -- but in this case, they already were together. "House arrest" is the unusual state that arises here. It's not what happens when your cards weren't compatible in the first place -- in that event, you simply can't put them together. It's important to note that some cards which extend compatibility do so in a very limited fashion. Children of Light and Gegis make your holograms compatible with each other, and with Ferengi personnel (respectively) ... but neither of them grants anyone any new compatibility with ships or facilities. Now with Emissary and Homefront V, there is a renewed focus on Nors. There are a lot of ways that your nouns can interact with Nors, and not all of them require compatibility. Some sites allow people to report, some even download, without asking that they be compatible with the station. Some sites, most of the classification-based ones, do require compatibility. The docking sites let you report/dock/undock based on conditions listed on the cards. One of those is based on compatibility: if "ship is compatible with station's affiliation". Why the strange wording? Because you can do this at the opponent's Nor, and a treaty only affects your cards -- actually "your A and B affiliations". You don't get to be or have any need to be compatible with your opponent's cards -- it's just not a concept in this game. But with the right treaty, your Apnex becomes compatible with the Cardassian affiliation (and thus your cards), and if your opponent has Terok Nor, then you can dock with it because you're compatible, not with it (it's an opponent's card, there is no compatibility) but with its affiliation. Emissary contains one new card that adds compatibility where it didn't exist before: Gagh Tek Or? Whoever you download with it becomes compatible with your cards. This might be Yeto and T'Kar, or Kurn, or a Worf that hasn't actually been made yet. Like with Scientific Diplomacy, these personnel are now compatible with all of your personnel and ships. That's a familiar concept, we've looked at other examples like that before. But there's another card type that has the icon: Reshape the Quadrant adds it to your Nors as well. What does it mean that your Gagh Tek Or Klingons are compatible with your Nor? As a minor point, T'Kar can use a Defense System Upgrade. It doesn't help with Nor docking, since the only compatibility that helps with that is between the ship and Nor, not personnel. It turns out to affect where the personnel can report when you download them with Gagh Tek Or. Obviously, if you have (or get) the Klingon Restaurant, they can easily go there (even if the "any Klingon" isn't from the Alpha Quadrant ... who'll be the first to do this with Regent Worf?). The same is true for other places where your Klingons can normally report, such as a facility or a Neutral Outpost. 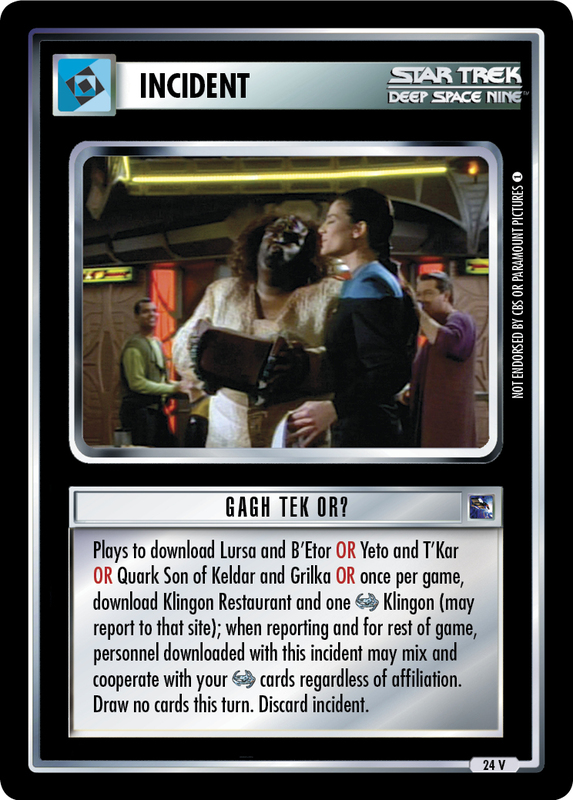 It might also be interesting to get off-color cards: Bajorans can use this to get Kurn, and Ferengi can use it to get Quark Son of Keldar reporting normally, along with Grilka through a Temporal Micro-Wormhole. Getting back to compatibility, if you have a way of reporting aboard ships, it may help that those Klingons are compatible with more ships now. (Think of Wo'Din and Assign Support Personnel.) And getting back to the fact that the Nor has the icon, your downloaded Klingons are now compatible with it, which means that you can download them and report them to the site that's appropriate to their classification. Martok can go right to Ops, or Yeto to the Science Lab.